Markham Banquet & Convention Centre is one of Scarborough’s most luxurious banquet halls and reception venues. Our spacious and beautiful facility provides you with the perfect setting, where you can host weddings, corporate functions, social events, parties and more. We offer four tastefully decorated banquet halls that can comfortably accommodate up to 900 guests. Whether you are planning a wedding, prom, corporate function, birthday, or family celebration, Markham Banquet & Convention Centre is your right choice, and you can count on us to provide you and your guests with a distinct level of service. We know how important your event is to you, and carrying it out successfully will definitely make it a joyous and a memorable one. Our facility is ideally located in the northern part of Scarborough, Ontario, which is close to Markham, Richmond Hill and easily accessible from downtown Toronto. With plenty of parking spaces and an easy to get to location, your guests will be able to experience an easy commute . Markham Convention Centre has been designed to create an atmosphere of warmth, luxury and elegance. Our unique facility is the ideal setting for any type of a banquet. Whether you are hosting a wedding, social, or a corporate event, our 29,000 square foot ballroom can be configured in a variety of seating arrangements to accommodate groups of 120 to 900 guests. 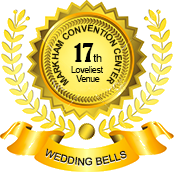 So, if you’re looking for an intimate setting or the backdrop to a grand occasion then Markham Convention Centre is an impressive venue, that will delight your guests. We know that planning and hosting an event can be stressful, tough, time consuming, and requires a lot of energy. And, one of the overriding factors in the success of an event is the choice of venue. At Markham Convention Centre we are completely in-tune with this. We will transform your requirements and expectations into well hosted, efficiently organized and delectable event. Our approach is simple and it works. As an organizer and event host, we view your event as a project and approach it with a project management method. We also view your event from the perspective of a guest, and we pay special attention to the details that will radiate warmth and offer hospitality to your gathering. Your guests will enjoy service par excellence in an exquisite milieu.